I've been sewing for decades but I'd never had an opportunity or reason to sew dog bandanas until a few years ago. 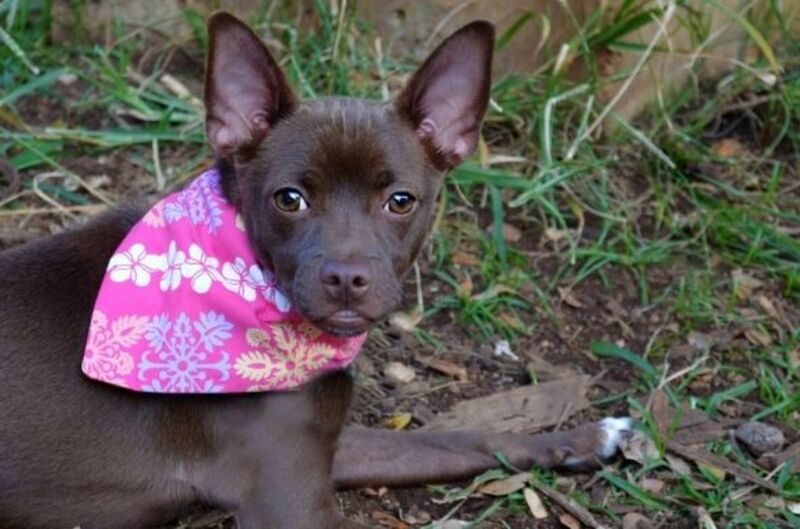 The local Humane Society sometimes outfit their rescue dogs in doggie bandanas. I decided sewing bandanas would be something I could contribute. Of the resources found online, a tutorial found on Childmade was the dog bandana template I chose (with slight modifications) to make a bandana for dogs. 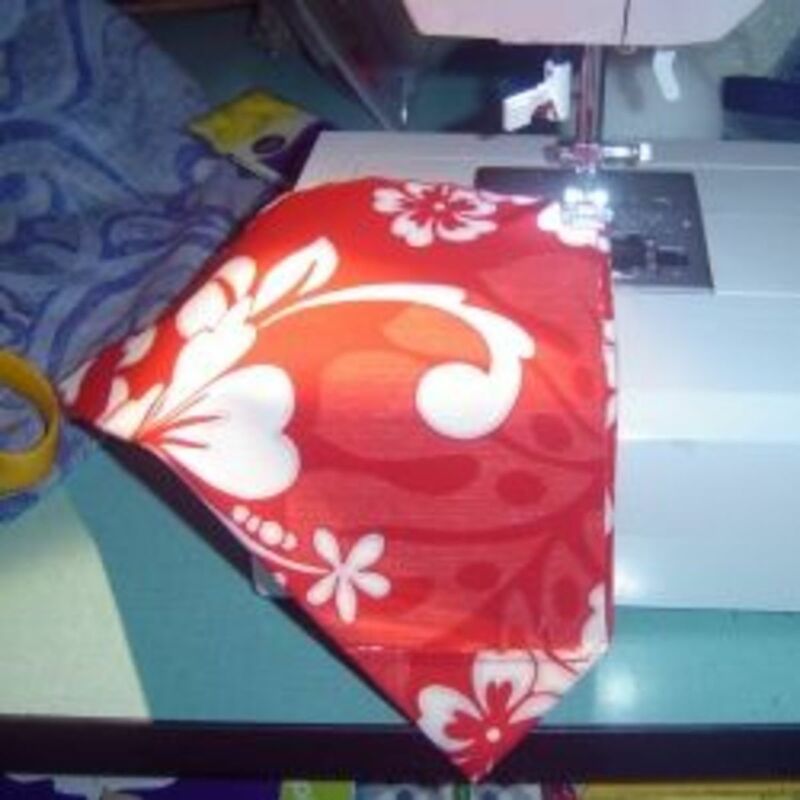 You can make a bandana for dogs by sewing a few straight seams. It's really as simple as that. This is a worthwhile diy project which can be completed by those with all levels of expertise in sewing. 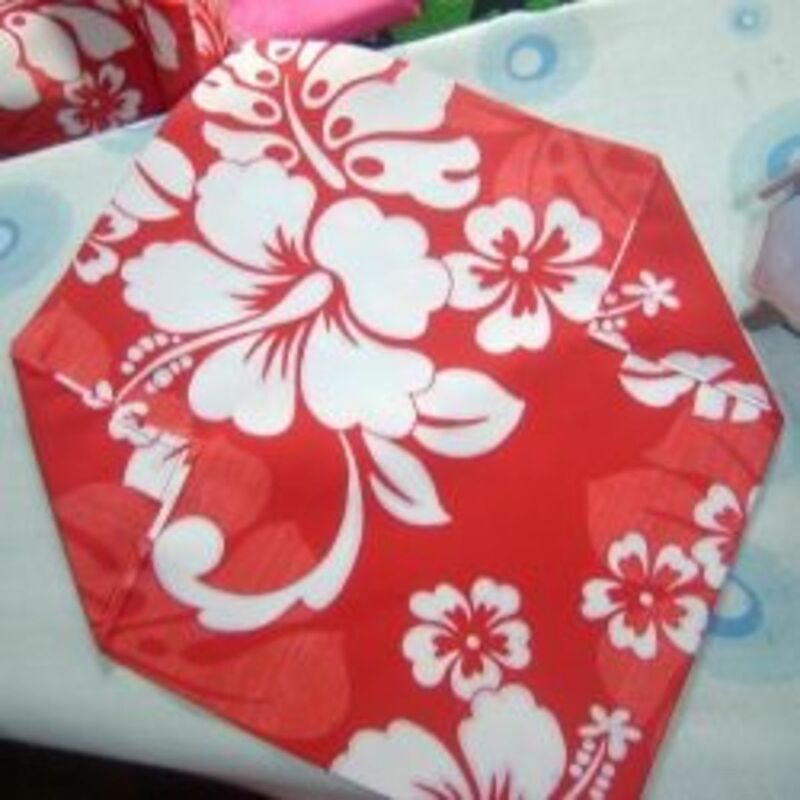 This page outlines the steps I used to make my first dog bandanas. This style of dog scarf has a simple casing for the dog collar to slip through which is a very practical and safe design for the animal. I opted to make the dog bandanas with doubled fabric which should hopefully lengthen their usefulness. 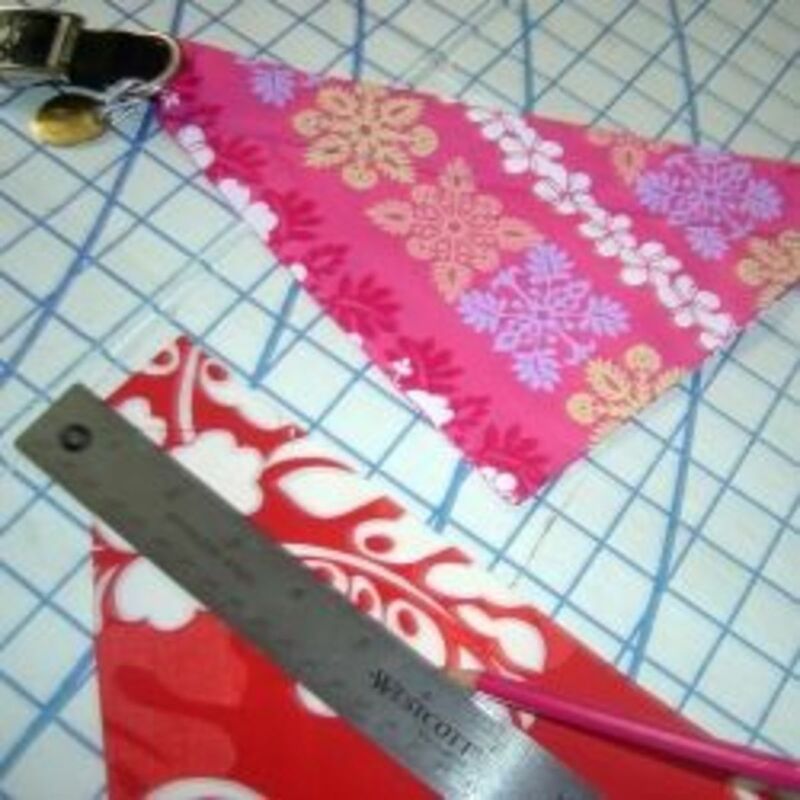 Choose washable cotton or cotton blend fabrics to make dog bandanas. Look closely at the picture above and you'll see I've placed slips of paper near one corner of each of the squares. Point the tip of the corner towards the center of the square and using a measuring tape measure SIDE to SIDE until the length of the fold is 2" for Small, 3" for Medium and 4" for both Large and Extra Large. 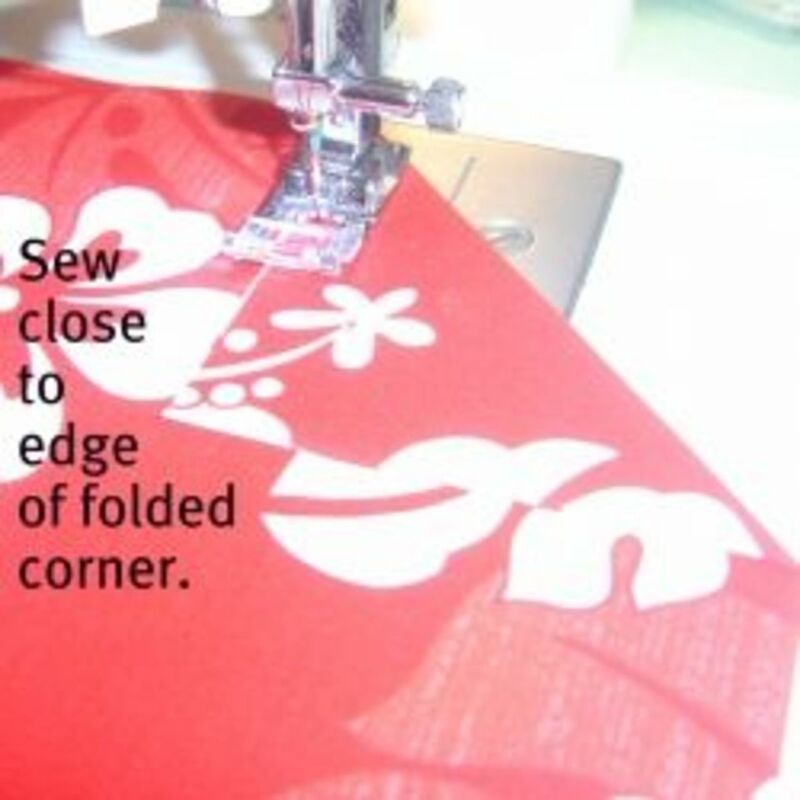 With a straight stitch, sew close to the edge of both inverted corners. Backstitch at beginning and ending to secure. Lovely Cinderella at the Hawaiian Humane Society wearing her dog bandana! The dog bandana fabric square should be smoothed out flat with the sewn corners facing UP towards you before completing next step. 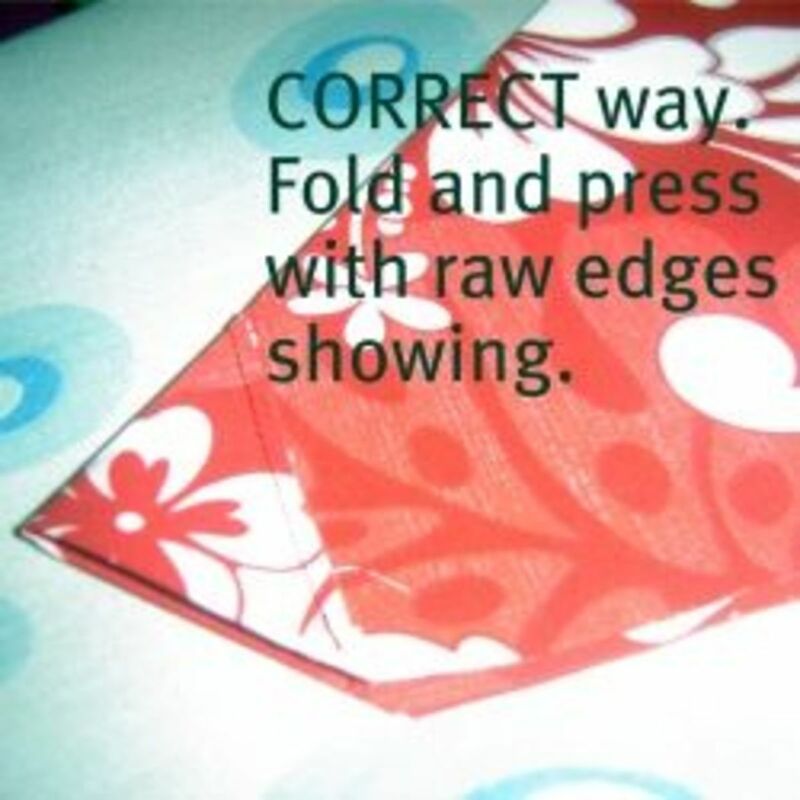 Turn dog bandana using the opening in one of the folded corners. 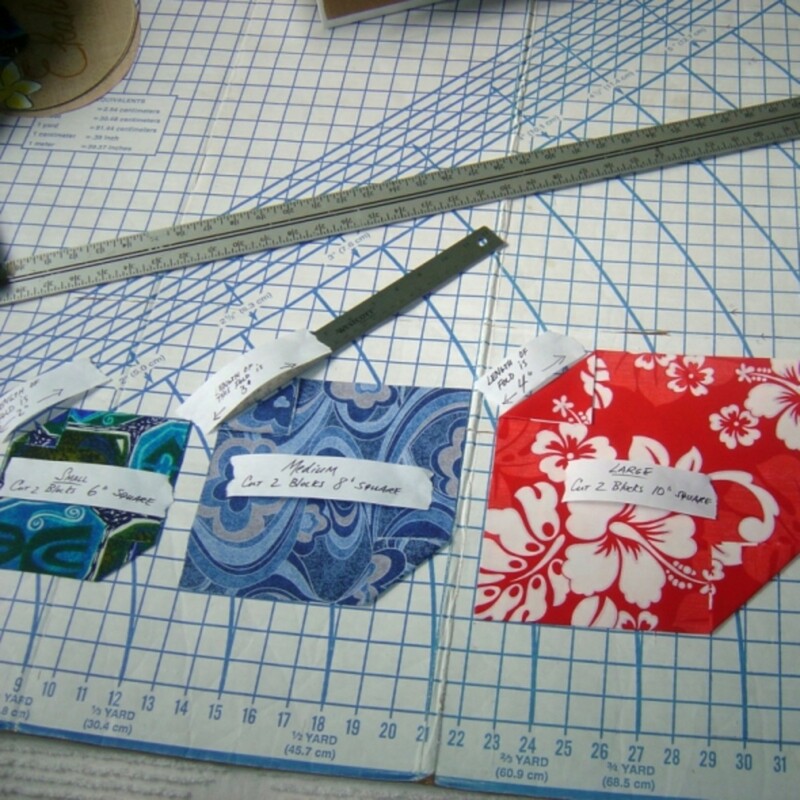 Once dog bandana is turned, press flat with iron before proceeding to next step. 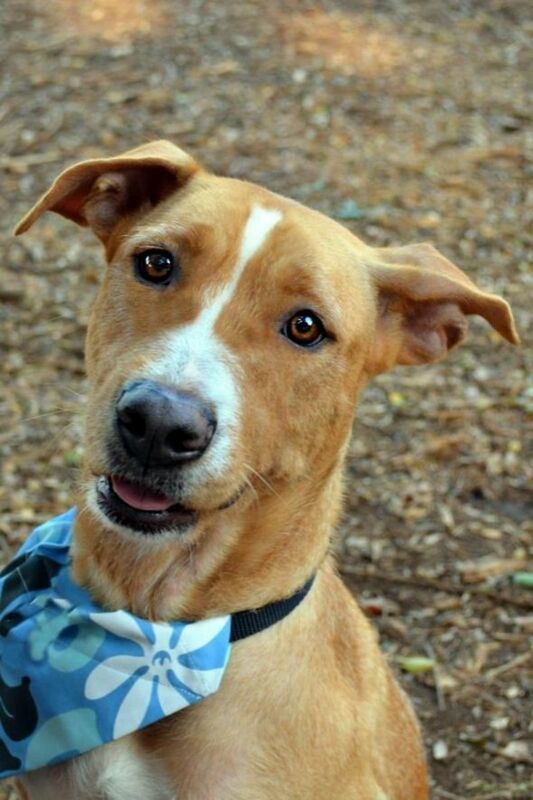 Adorable Mooshoo at the Hawaiian Humane Society wearing her dog bandana! To form the casing for the dog collar, I used a pencil and ruler to draw a straight line from the bottom of one corner fold to the other and running parallel to the top fold of the dog bandana. 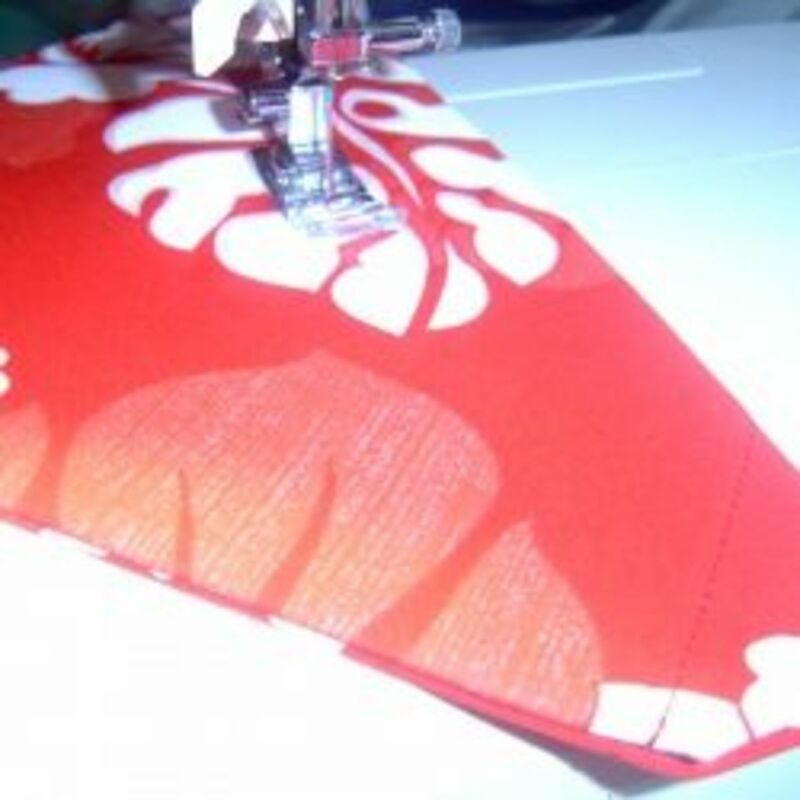 At sewing machine, stitch exactly along the pencil line drawn in previous step. This stitch creates the casing for the dog collar to slip through to complete the dog bandana. Make a Bandana for Dogs - in colorful, cotton fabric! 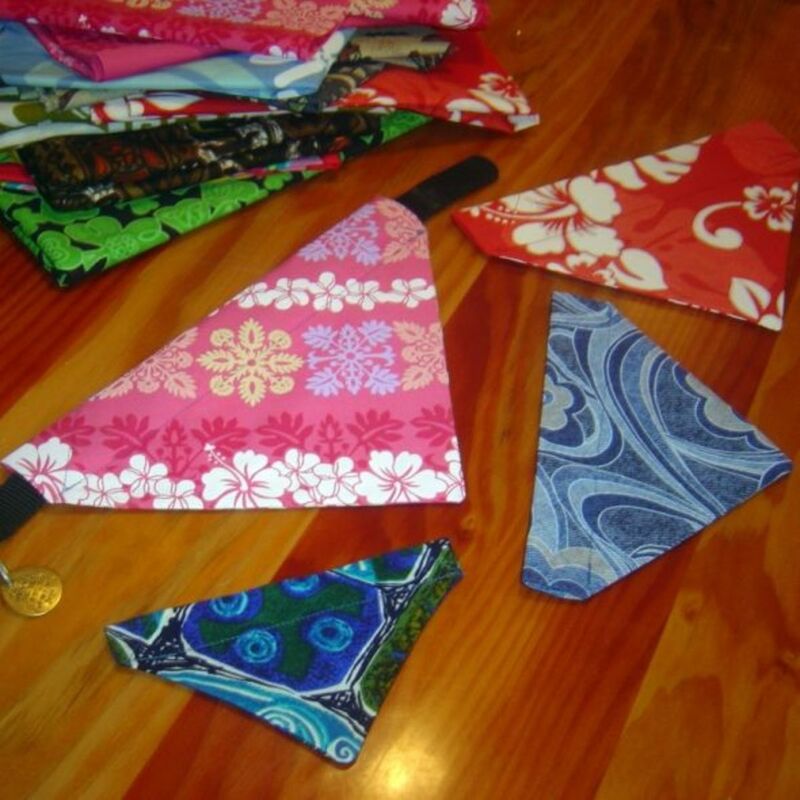 To make a bandana for dogs, choose a washable cotton fabric in design and color of your choice. For the rescue dogs at the Humane Society, bright cheerful colors are great, but I'm sure they would gladly accept dog bandanas in any color. These dog bandanas are easy to remove from the collar and launder when needed. 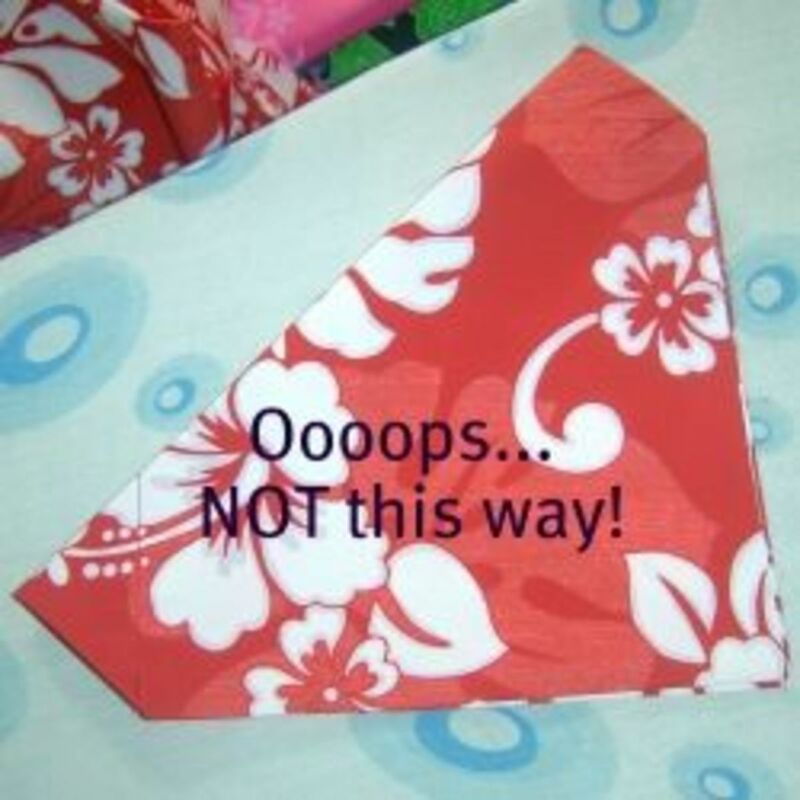 (The double sided fabric allows the dog bandana to be flipped over if one side gets soiled before laundry day.) I feel this design is also very safe for the animals because the collar is slipped through the casing. There are no ties to worry about the dog catching on something nor do you have to worry about losing the dog scarf. A Bandana for Every Season! This is a great deal for those of you who don't sew! Will you be making a bandana for dogs? Thank you for the amazing post!! These were so fun to make!! I made reversible Halloween ones for my daughters dogs! They came out sooo cute!! Thanks for these great instructions and pictures. I do have a question...why do you cut two squares...I can't quite figure out why the need for two...thank you. I like this method! It's so much nicer than a bandana that has to be tied. 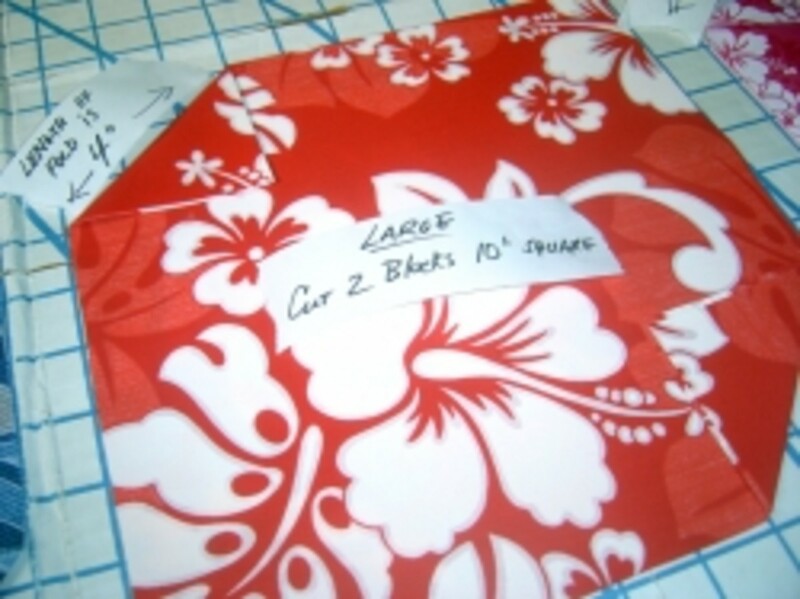 Could I suggest that you take new photos while making a bandana where the two squares are a different solid color? In these photos with the red print it is very difficult to see what's going on. Once I figured it out everything turned out fine but new folks to your directions might appreciate it. Thanks for sharing your method. Thank you for sharing. Whipped one up in 10 min last night! I will try a 12" square for my Labrador Retriever. I'm not really crafty, but I think I should try this. Thanks for the easy and detailed instructions. My babies will surely love this. Have sent your Lens to my wife. She has been crafty lately. I made this for my dog following the easy instructions. It turned out great except there wasn't quite enough room in the collar channel to get his dog tags through without removing them from his collar so made my second try just a little bit wider to allow for that. I will be following your lead and making a bunch of these for our local shelter. Great idea!! 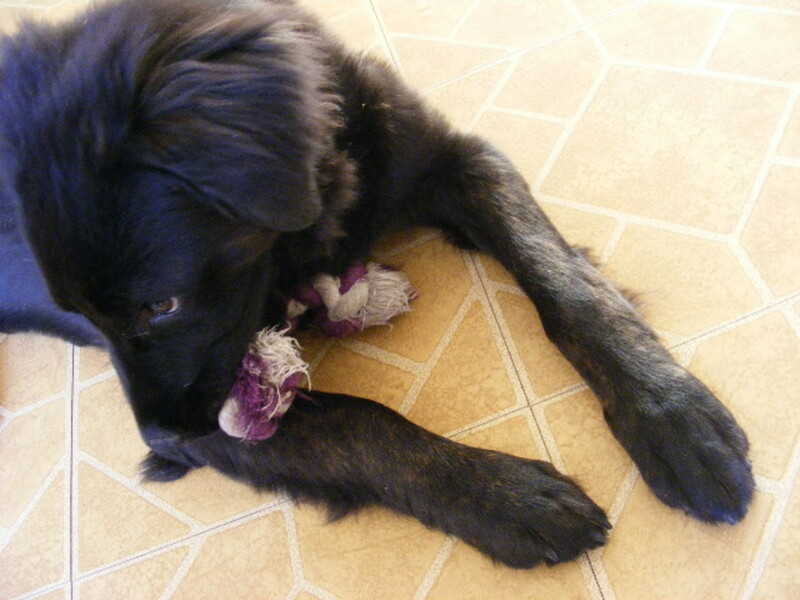 @Qwackers: I slide our dog's collar through the casing from the side of the collar with the holes. That way I don't have to worry about her tags squeezing through the casing. Thank you for sewing for the homeless animals too. YAY!!! My Sally will look very nice with this.I'll put a note in my diary to sew one for her and her best friend Casey before Winter comes. Thank you. This is such a nice lens and what a great idea. There are ways we can all help. It is strange to think of a dog needing a scarf. 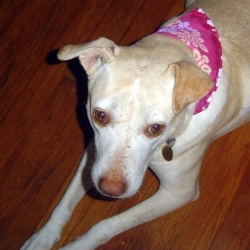 My Mini (unfortunately no longer with me) never wore a collar and I don't think she would have tolerated a bandana, You certainly have done a good job in explaining how to make them and I am sure many will be doing just that before long. Well done lens and worthy of a purple star. Was looking at the dog coats for my German Shepherd orange colour one is cute. So cute! I think I need to make one for my sweet puppy, Layla! I pulled out my sewing machine today for a project that I am now putting on hold to make a doggie bandana! What a great lens. Every dog deserves his or her own bandana. A dog just would not be complete without one. Gotta admit, these are dog-gone cute. I always loved the look of a bandana around a dog's neck. Your doggie looks so sweet. I think it's great that you make these banadanas for rescue dogs. Great job here, with nice clear photos. Thanks for the instructions. Thank you for sharing this pattern. I'm going to give it a try. Thank you for this great idea. One of my online friend's dog has just been diagnosed with cancer and she was asking for bandanas for him to wear every day, a different one. This was easy to make and I am hoping Joey will like it. Both my dogs love their bandannas. I've never thought of making them myself though, but will have to start now. .
@Pam Irie: Thanks so much! That makes a lot of sense. Oh, and sorry for the double post before- I didn't realize I did that. @anonymous: Hi Carol! That's a good question, however, because I make these to donate to shelters and rescue groups, I prefer to DOUBLE the fabric which actually lengthens the "lifetime" of each bandana because they are washed so frequently. The single fabric bandanas don't hold up as well. This is great! I was wondering why the need for 2 squares of fabric each? 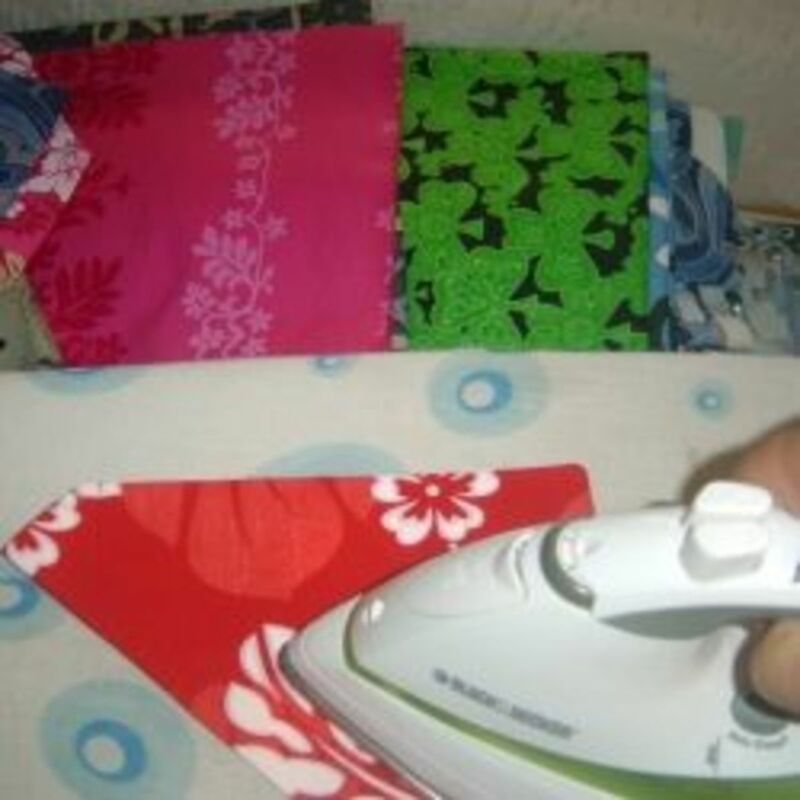 They can be made the same way using just one square of fabric as long as you fold and sew them the correct way. Is it just to add the thickness? 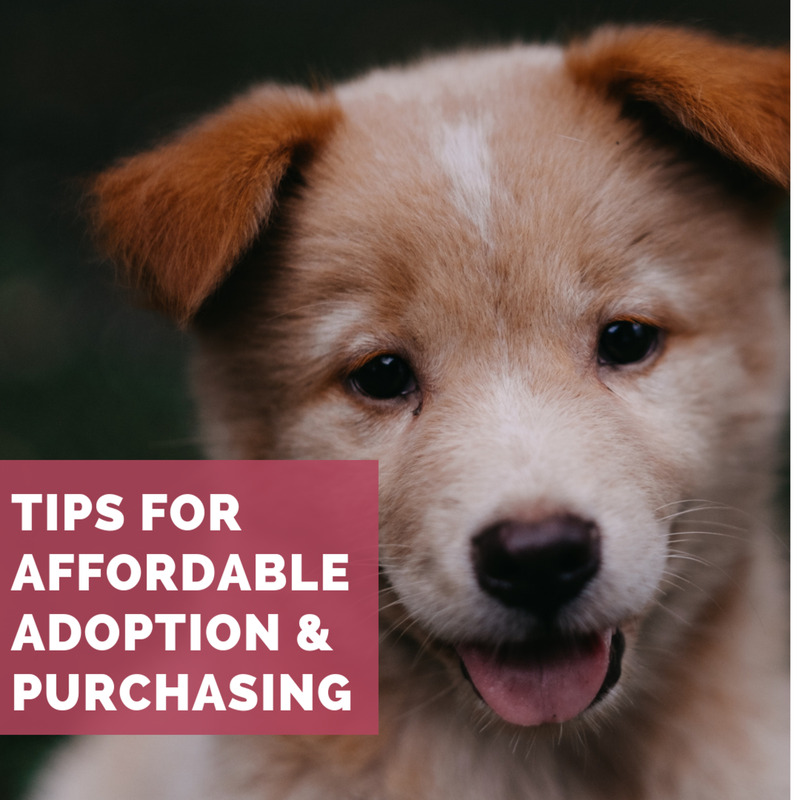 I have made them both ways, and was thinking it would be much quicker and less costly to use just one square if making a bunch of them for shelters, animal rescue groups and pups in foster homes. Just curious if it would be a problem to make them this way. Thanks so much for the tutorial! This is awesome! I'll bookmark this so I can make it as a welcome present for Sally. She's coming to our family very soon. We've just adopted a five year old Labrador. I can't wait to make this for her. Thanks for sharing. @anonymous: If you know how to sew, I bet you can get a used sewing machine for maybe $50-$60. Look in the classified of your newspaper, look at Salvation Army,other chairities, advertise for one in your Churc Bulletin. Puta sign up if zGrocery Store has a bulletin Board. Sewing machine shops sell the used machines that they have taken in trade when someone is buying a better machine. Those are repaired, cleaned, etc. WalMart sells them, too. 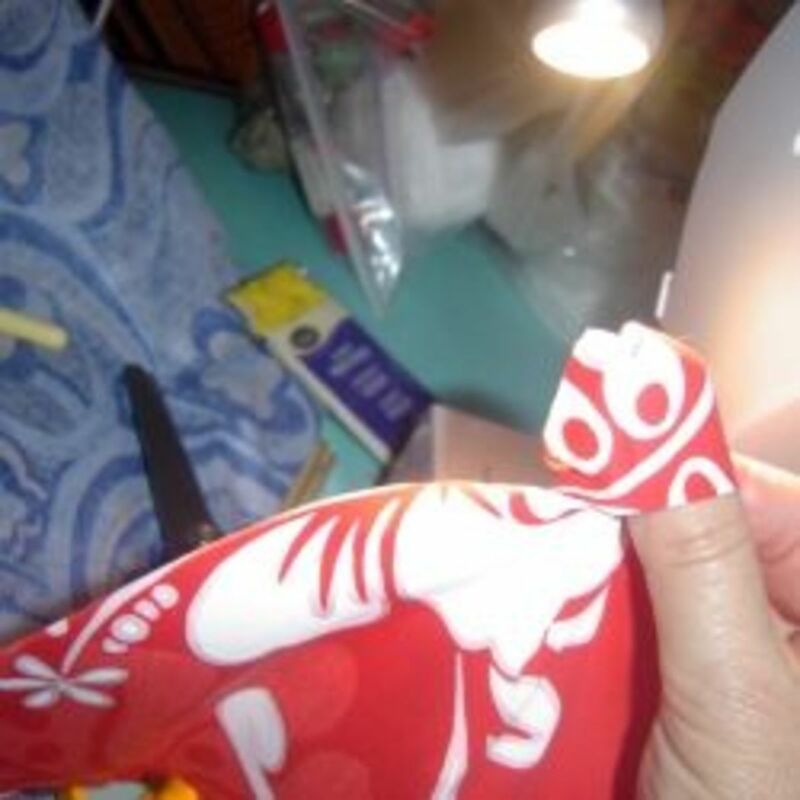 I know their is a website on line where people post specifically to sell sewing ma hines. looks very simple to do a bandana , I will try to make some for my poodle follow you . thanks ~! I dont have a sewing machine, wish I could find someone to make them and then have it say adopt me on them so my fosters can wear them.. Yes, absolutely - that is why I'm reading your great step-by-step instructions! She (our Bichon Frise, Coquette) wears bandanas but needs a better variety! Loved your lens! I have two wonderful dogs. Might try my hand at making one. Thanks for sharing. Whew! So glad I'm not in Hawaii! Cinderella would have been my girl. I can see it in her eyes. You're blessed, I'm blessed and I'm hoping Cinderella's fairy tale ending comes true. Sure thing! This is such a wonderful idea! Thanks for sharing this lens. What a neat idea. They do look nice. 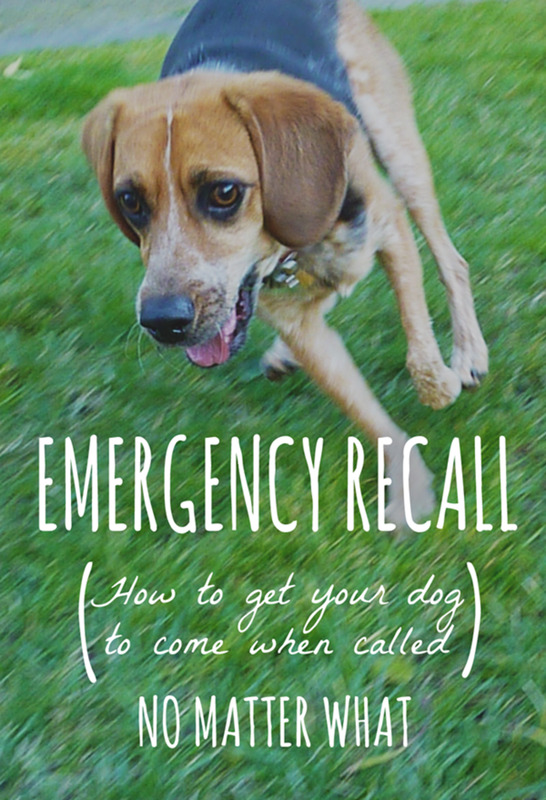 These are great instructions and the dogs are so cute in their bandanas. We love our bandana. The collar slip on idea is so much safer than a knotted bandana that might get caught on something. And, it looks great -- all nicely finished and reversible. So stylish! 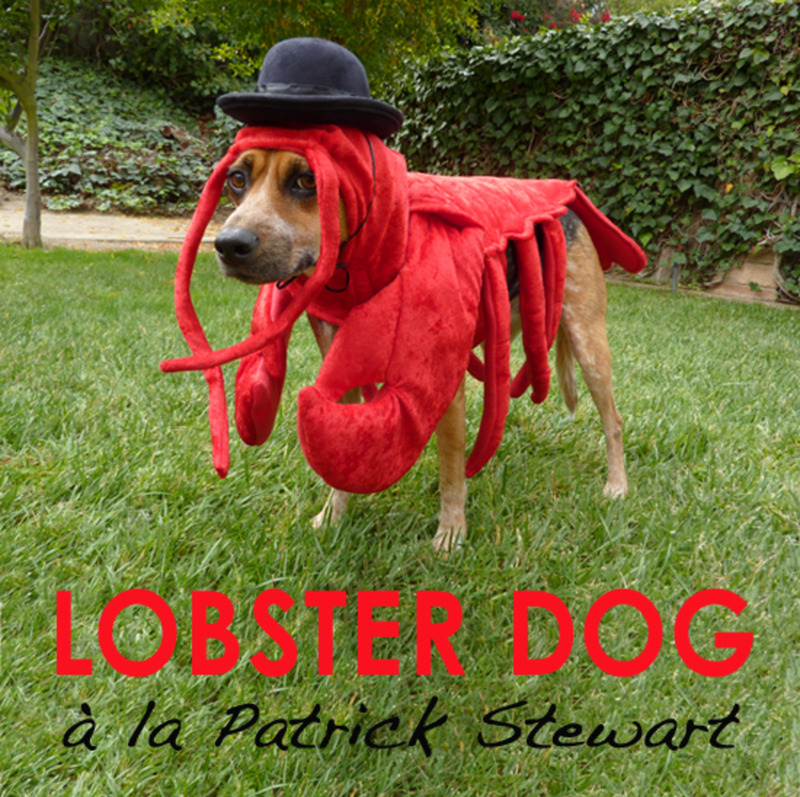 This is a great project and who wouldn't love all the dog pictures? These look cool. Might have a go at making one for my parent's terrier. I think he would like quite cute in a red coloured one. This is what I wrote on Facebook: "Dogs. Dressed up cute. Need I say more?" Very cool, and your life living in Hawaii - helping Hawaiian dogs, that sounds pretty fun! Great Lens with great resources! What a wonderful way to share the love for animals. Great lens. I don't have a dog, but I have 2 cats. I think I'm gonna make bandanas for my cats. Wish me luck! Wonderful idea! These bandanas are beautiful. Wow, so beautiful bandanas. I gonna make it for my sister's dog. beautiful bandanas for beautiful dogs! I think I am in love with Cinderella! I like to do it the easy way, just tuck it in their collar tight! Maybe one for our goat. :) We don't have a dog. Super cute! wow, nice lance. I like the dog picture, and the scarf are really sweet!. Very cute and great instructions. Congrats on the front page!! Hehe, super cute :) Thanks for sharing. I love that you showed how *not* to do it, too! :) Bandanas are a great idea for the big "scary-looking" dogs who are looking for homes, because that little touch of fashion makes them look so much more like pet dogs - makes it easier for people to visualize them as their pets and just that little bit more open to the idea of adopting them. We recently found a little white pup who needed a home and my parents took her home. 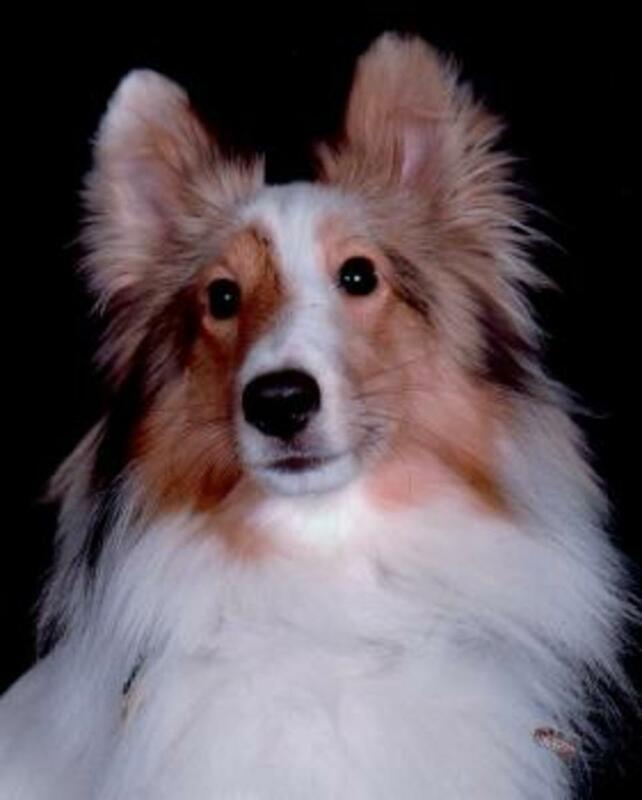 She was left behind when a pet store went bankrupt and my dad was recovering from 2 surgeries. Mom needed something to take care of besides worrying about dad (he is ok now by the way and loves Lilly as much as mom). Anyways we also bought mom a sewing machine for Christmas so I will share your lens with her so she can make Lilly some pretty bandanas. I love your choice of colors. Congratulations, Pam, on the front page feature!! I can see the big smiles on dog's faces as they go out in their new bandana's and look at themselves in every window with an little extra prance in their steps! Congratulations on a front page feature! Yes! I'll be making it for my dog and his friends for his birthday party. Great idea! When I fostered, I had 3 collars made with "Adopt me!" on them. Whenever I took my foster dog with me, I'd put on that collar so people automatically knew the dog was available to a loving home. 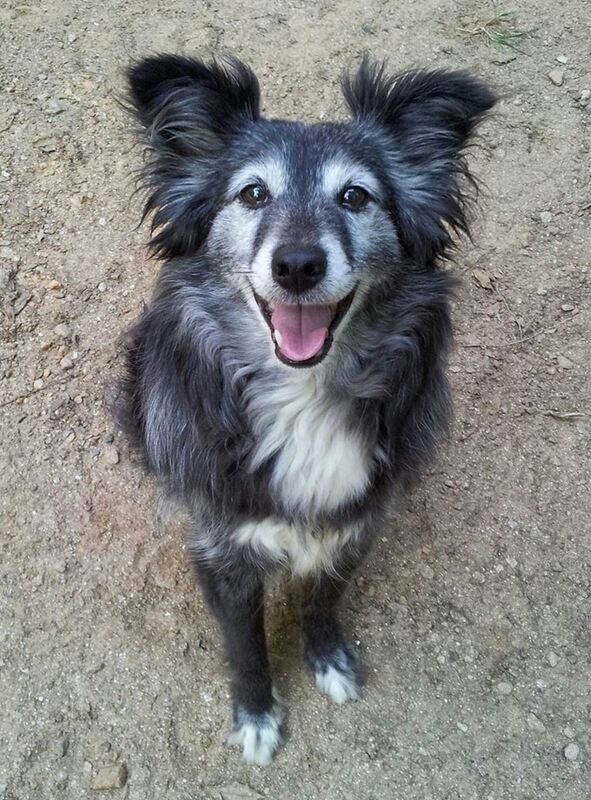 Fostering dogs, along with caregiving for Mom, was the most worthwhile thing I've ever done. Excellent lens, Pam, and very blessed.